G'day and welcome to Partakers Wednesday Worship on the 20th of July, 2011. Lets start today with a song "Your Love O Lord"
For you are beauty in holiness and majesty. we acknowledge you are the Almighty One. We thank you that we can worship you! Our Old Testament reading today is taken from Psalm 89. Our reader today is Richard, so over to you, Richard! 6 For who in the skies above can compare with the LORD? 8 Who is like you, LORD God Almighty? Throughout the Bible, God is called Almighty. For example, in our Old Testament reading from Psalm 89v8 we read "Who is like you, LORD God Almighty? You, LORD, are mighty, and your faithfulness surrounds you. " But how is God, almighty? God being Almighty, can be summed up in 3 words. Omnipresent -God is Almighty, in that He is wholly present everywhere. He fills the universe in all its parts without division (Psalm 139v7-12; Jeremiah 23v23-24). For example in Ezekiel 1, Israel is in exile in Babylon and they thought God was left in the Temple in Jerusalem. Yet God appears to Ezekiel in order to show that God was also in Babylon with His people! He is also present within all those who are Christians, because God the Holy Spirit lives within them! Omnipotent -God is Almighty, in that He has unlimited power to do all things that are the object of power. With Almighty God nothing is impossible. But we have to take those verses from the Bible and read them in context. That is because there are things God cannot do. He cannot do anything that is contrary to His own nature. For instance, He cannot declare something infinite if that something is finite. Or because God is holy and cant look upon sin, God cannot therefore sin. If it was possible for God to sin, He would case to be God Almighty and therefore need His own saviour, which is certainly impossible and untenable! Omnipotence is an essential quality of God for if God were not all-powerful then He would not be God and would not be worthy of worship. He has amazing power! God created the universe with His eternal and infinite power! God made everything out of nothing and He sustains it and gives all of it life! Omniscient - God is Almighty, in that He is has perfect knowledge of all things. The Psalmist writes: "O Lord, you have searched me and you know me, You know when I sit and when I rise...You discern my going out and my lying down; you are familiar with all my ways" (Ps. 139:1-2a & 3). God knows all things, past, present, and future and all possible circumstances, solutions and outcomes. Therefore He knows all that we do (which includes the remembrance of all that we have done), all that we think (and the record of those thoughts), and all that we do say and all that we could say. So God is Almighty in presence, power and knowledge and He is mighty to save. As we seek to live holy lives, let us remember that whatever we do, Almighty God is watching. Watching not to condemn us, but watching in order to love us as any good father does to his children. And save us, He does! Jesus Christ, being the Son of God will do an amazing thing to all those who have taken up His free offer of salvation. And because we are saved, the Spirit lives within us! Almighty God who is amazing! And yet this amazing and almighty God, who has us as children, can do something like this. "Look! God's dwelling place is now among the people, and he will dwell with them. They will be his people, and God himself will be with them and be their God. 4 ‘He will wipe every tear from their eyes. There will be no more death' or mourning or crying or pain, for the old order of things has passed away." 5 He who was seated on the throne said, "I am making everything new!" Then he said, "Write this down, for these words are trustworthy and true." Revelation 21v4, isn't that just the most amazing verse with a great big WOW factor? Picture it! Jesus Christ taking your face in His scarred hands and He will wipe away your tears - tears of suffering and tears of joy. God is Almighty! Almighty in presence, power and knowledge. Yet this Almighty God, is full of mercy and grace, and when time on earth comes to an end, He will wipe away the tears of His children. Amazing and Almighty God. Lets speak to this Almighty God now. Let's pray! Lord, again we lift to you all those affected by the drought in the Horn of Africa. Hear their cries! Help the aid agencies and national governments to assist these people quickly! Stoke up the imagination of people who can help those in need and find solutions to these ongoing problems. Help those who are richf financially to give generously. Where there is conflict and strife, Almighty God, bring peace. Where there is great need, Almighty Father, bring supply and solutions. Where there is injustice, bring justice. I bring before you now, Kathy, the mother of a dear friend. Lord, you know her situation! You know the worries of the medical staff and family concerning her. We pray for quick healing and assure her of your love for her. We ask this in Jesus Name, Amen! See you next time on Partakers! www.partakers.co.uk and if you have prayer requests, visit www.facewall.co.uk, post your request and we will pray for you. G'day and welcome to Partakers Wednesday Worship on the 27th of July, 2011. We praise you God the Holy Spirit, that you lives inside us as a deposit and seal of our salvation! We come now to worship you! Our LORD, let your worshipers rejoice and be glad. Luke 6v38 - "Give away your life; you'll find life given back, but not merely given back-given back with bonus and blessing. Giving, not getting, is the way. Generosity begets generosity." Luke 12v33-34 - "Be generous. Give to the poor. Get yourselves a bank that can't go bankrupt, a bank in heaven far from bankrobbers, safe from embezzlers, a bank you can bank on. It's obvious, isn't it? The place where your treasure is, is the place you will most want to be, and end up being. Psalm 119v76 - May your unfailing love be my comfort, according to your promise to your servant. Matthew 11v28-30 - Come to me, all you who are weary and burdened, and I will give you rest. Take my yoke upon you and learn from me, for I am gentle and humble in heart, and you will find rest for your souls. For my yoke is easy and my burden is light." I wonder if you have ever felt like God is far away? Well you aren't alone! It is an experience that is common to all Christians, at some point or another. I know I have experienced that feeling!. But I also know from personal experience, that Jesus always comes through in difficult times. Although He may not come in the time I think He should come, because He knows when I need Him most. Jesus Christ is calling you to Himself! He wants you to be a partaker of the good news about Him. He wants you to be part of His family, the church. He is ever calling, ever beckoning people to enter into relationship with Him. His love for the church is indicative as he calls his beloved church, his beautiful bride. That is the church - warts and all - its His bride! By faith, He will see you through - Remember in the Gospels, when the disciples were in the storm and Jesus came to them walking on the water. Remember Jesus saying "Come" and Peter went to Him. This must have encouraged the other disciples, for upon seeing Jesus' power they worshipped him. Whatever troubles you are undergoing are temporary, and Jesus will see you through. I also know that to be true! Jesus is praying for you, will come to you, grow you and help you through troubles. By being obedient to God, you are encouraging others by showing your salvation and showing that faith is not blind, but active! Jesus wants to hear your voice talking to him... Not just for half hour in the morning but all day long. We are to yearn to talk to Him and for Him to talk to us. Prayer is a 24 hour communication exercise. God Himself assists as we pray: by correcting and strengthening the yearnings. Prayers express desires, praises and thoughts in a contributory way to the journey we are on. That means tell Jesus how you are feeling, both in the good and the hard times. Tell Him of your wants, your needs and all your cares.. Let His arms surround you! To him your voice is sweet and dulcet. Your face to Him is a delight. Seek him! Ask him! Talk to him! This is how you are spiritually energized! When you talk to God, you strengthen your relationship with Him! When we ask others to pray for us, Church unity is strengthened! Jesus feeds, nourishes protects, shelters and loves his church and all its members. Jesus loves His people, the Church. One day, Jesus is coming back for His church! We don't know when that will be but we are to encourage one another and spur one another on as we see the day approaching when our bridegroom, Jesus Christ comes again in glory! Jesus Christ, the great lover and bridegroom, loves to hear our voices, the voices of His church the bride, as we express our love, gratitude, cares, worries and feelings to Him. Go and be a voice of encouragement to somebody today. We all need encouragement at times and if you go and encourage somebody, you may just be helping them out. Thank you. of your love, power, majesty and glory. Today on Partakers Wednesday Worship we have special time to lift the nation of England to God, in light of the recent social unrest and riots. I will say a quick prayer, then there will be time for you to offer your own if you so desire, and we will finish with the Lord's prayer. Thank you. We lift to you the situation in England today, with social unrest. Help the politicians, authorities and officials to wisely administer justice! Help them to also protect civilians and the innocents, O God.Father, keep those who are helping to clean up and right the wrong to be safe and for them to use wisdom in making decisions! And now a time of silence for you to reflect and offer your own prayers. Lord in your mercy, hear our prayers! G'day and welcome to Partakers Wednesday Worship on the 17th of August, 2011. Song - O For A Thousand Tongues! the honours of thy name. My Jesus is unique, majestic, tender, wise, strong, and lovely. That is my Jesus, whom I seek to serve and obey in every facet of life, every second of every day. I don't always achieve it, but I know that when I fail, I can ask for forgiveness and He will grant it from His wellspring of gracious mercy. Yet another WOW factor about Jesus Christ. It is this Jesus whom I depend upon and personally know to be totally reliable in every way. When people let me down, turn away from me, discourage me, think wrongly off me, incorrectly assume my motives. This Jesus always picks me up, never turns me away always encourages and embraces me. All through each day, I know that Jesus has been dependable, going ahead of me! Amazing! This Jesus who died on a Roman cross two thousand years ago was the same Jesus who was raised from the dead, without decay, into newness of life and ascended to the right hand of the Father. This Jesus is coming back to gather His followers, to Himself. Jesus is coming back, but not as a baby this time. There will be no kitchy-kitchy koo factor. No! Jesus is coming back with a big WOW Factor as the King of Kings and Lord of Lords. Among the lampstands was someone like a son of man, dressed in a robe reaching down to his feet and with a golden sash around his chest. The hair on his head was white like wool, as white as snow, and his eyes were like blazing fire. His feet were like bronze glowing in a furnace, and his voice was like the sound of rushing waters. In his right hand he held seven stars, and coming out of his mouth was a sharp, double-edged sword. His face was like the sun shining in all its brilliance. That's the ascended Jesus Christ as portrayed by his friend John! Are you suffering today with some illness or you are in the middle of a period of grief? We all suffer in some way. I had a stroke back in 2003 and recovered. I still get aches and pains. But one day! One day you and I will have perfect bodies. WOW! And not only that, but this God suffered and died on a cross, so has sympathy for our own suffering while we are in this world! Jesus is coming back and will do the most extraordinary thing. We read about it in Revelation 21:4 ‘He will wipe every tear from their eyes. Isn't that just the most amazing verse? Picture it! Jesus Christ taking your face in His scarred hands and He will wipe away your tears - tears of suffering and tears of joy. You will say to yourself, it was all worth it - the trials, temptations, sufferings and experiences I have had for the sake of Jesus Christ my Master. Just when you are thinking about giving up. You've tasted your last sip of life's bitter cup. You can't find a friend to understand or care. If you'll just look up, you'll find Jesus standing there. And here comes Jesus! Walking on the water. Here comes Jesus! He's calming the storm! Here comes Jesus! Making life peaceful. Here comes Jesus, bringing everything back to norm. Satan is killing and stealing as he goes. Everything God gave us through Jesus, His Son. But, two-thousand years ago, the victory was won. Oh, here comes Jesus! Calming the storm! Are you struggling to make a major decision and don't know what to do. Seek the wisdom of Jesus in making that decision. He will help if you ask. It may well be that you are feeling desolate, abandoned and lonely. Or you are feeling tired, drained, burdened and in need of help. Allow Jesus to give you the strength to endure! Give the burden to Jesus and let Him take the weight for you. Let Jesus wrap you in a warm embrace, encompassing you with loving compassion. We now have a time where you can offer your own praises and prayers. Lets pray and praise! Father God, in your mercy, hear these prayers of your children! For we ask them in the name of your son, Jesus Christ and in the power of the Holy Spirit. Amen! Bible Talk - God's Love and you! G'day and welcome to Partakers Wednesday Worship on the 24th of August, 2011. John 14:21 Those who accept my commandments and obey them are the ones who love me. And because they love me, my Father will love them. And I will love them and reveal myself to each of them. The world is in love, with love! Love sells everything! But what, or rather, who, started love? God did! The Bible tells the story of this God of love and we are going to very briefly in our time together talk about this great subject! Perhaps more books are written about the love of God than anything else! How is God love? God is a trinity or tri-unity! That is, God is a living, vibrant and dynamic community of love! Every activity of the Trinity is an expression of love. God loves because that is His very nature. God the Father loves God the Son and God the Holy Spirit. God rhe Son loves God the Father and God the Holy Spirit. God the Holy Spirit loves both God the Father and God the Son. A perfect community of love. God's Love is described throughout the Scriptures from Genesis to Revelation! Here is a very brief description of it: Unfailing! Everlasting! Intimate! Sacrificial! Unbreakable! All-conquering! Personal! Great! Immeasurable! All knowing! How is God's love seen? It is seen supremely in the Cross of Jesus Christ, when He died for the sins of the world. Supreme love overcoming all that is not love. It is seen in the love that people have for others. When you hold somebody's hand or give that telephone call just to say hello - that is love. Even with all the acts of evil in the world, love is all around. You can see it at the arrival halls of airports where family members meet each other. You can see it in the cafes where friends meet for conversation. You can see it as couples get married. Love exists even in the middle of that chaos, turmoil and hatred. Yes there are people filled with hatred and commit acts of unmitigated evil - but even those people have experienced love of some kind despite their not remembering it, being aware of it or even in spite of it! Even if it was the guiding hand of their parents to alert them from danger or the greeting of a close friend. Going further, the love of God is seen when Christians, who proclaim their love of God, love others. Churches are also to be enabling radical love in their communities! Not a love which is impractical but a love which is self-sacrificing! A love mirroring that of Jesus Christ on the Cross. It is by helping supply the practical needs of others, even to the point when it hurts to give! The supreme way to show you love God is to give to other people - both in the church and outside the church!. Love is not wishy-washy though! Love is tough! When Jesus died on the cross, that was tough love as He died. Love involves discipline such as the guidance of a parent stopping their child from putting their hand on a hot pan. Avail yourself of God's love today and more importantly show the love of God to others today! A kind word, a surprise gift or an helpful act! God's love releases us from the things that entangle our daily walk with Him. The more you hold onto His love, the more you will desire it and the more it will be revealed in your daily life. Put your love in action today, reflects God's love in action on the cross. Go and love - to the glory of God! Love not just in words but also in practise! Love all that you meet with practical love showing a loving God in action. By loving others, we help heal this broken world we live in with all its traumas, natural disasters and conflicts. Love! Go! Love! G'day and welcome to Partakers Wednesday Worship on the 31st of August, 2011. Bible Talk - What have you given up? G'day! Welcome to Partakers Wednesday Worship on the 31st of August, 2011! Lets start with prayer! Merciful Lord we come now to worship you in Spirit and in truth! Cast your light upon us so that we may reflect your beauty and majesty to those around us who do not know you personally! Again I tell you, it is easier for a camel to go through the eye of a needle than for a rich man to enter the kingdom of God. When the disciples heard this, they were greatly astonished and asked, Who then can be saved? Jesus looked at them and said, With man this is impossible, but with God all things are possible. Peter answered him, We have left everything to follow you! What then will there be for us? What is more, I consider everything a loss compared to the surpassing greatness of knowing Christ Jesus my Lord, for whose sake I have lost all things. I consider them rubbish, that I may gain Christ and be found in him, not having a righteousness of my own that comes from the law, but that which is through faith in Christ- the righteousness that comes from God and is by faith. I wonder what you have given up, since you became a Christian? From our bible readings, we know from Peter and Paul, that they gave up everything in order to follow Jesus Christ. When Jesus Christ called you to follow Him, He bid that you die to self and follow him whole heartedly! Again, I ask you - what have you given up in order to follow this Jesus you claim to serve and follow? You are called to love God with all your heart, soul, mind and will. You are called to exhibit this love practically, in loving other people. My wife and I have we have given up almost everything to follow Him, in creating this ministry of Partakers. For a very brief synopsis, we have left our families in our home countries, given up our own home in London and a good job with a good salary. We did all this to go serve God ultimately with Partakers via theological college. And He calls us to keep on following Him faithfully. I don't say this in order to gain any glory for myself but rather to glorify the God who called me and my wife to follow him wholeheartedly! Again I ask what you have given up in order to follow Jesus Christ? What Jesus Christ has given up for you? What you have and can give up for Him? How you can practically exhibit your love of Him with all your heart, soul, mind and will? Thanks for joining us on Partakers Wednesday Worship! See you again real soon! Bible Talk: God's Love for you reflected! Song: Hallelujah! What a Saviour! Time of Silence for praise and prayer! Our bible spot today is by Jim Allis and he is sharing some insights about worry and fear. Maybe today you are worried about some matter and wake up at night concerned about why God is allowing this or that in your life. Questions come flooding into your mind Why Lord? Why? What are you doing with me? Are you really there? Friend, listen at these reassuring thought based on God's precious holy Word. We are instructed to read it to be wise, believe it to be safe and practice it to be holy. So then will Jesus keep me safe? When we look into the gospel narratives of Jesus with his disciples He is always there when they need Him most. On the sea of Galilee they are scared of the fierce waves and what do they see? Jesus Himself actually walking on the very waves that threatened to break up their ship and drown them. Do you remember His words? Only two but so, so important. "Fear Not"
We need constantly to remind ourselves that Jesus is the Co- Creator of those waves. Nothing, absolutely nothing, can happen to those disciples He loves except He allows it for a purpose. They were safe and we too are safe by His presence within "in the storm" Because "we are kept by the mighty power of God through faith..............." 'Kept' is a military term used here in this verse meaning 'garrisoned' Garrisoned around and fully protected. Think of a castle made secure by way of a Moat and Keep. Remember also that the disciples were quaking in fear behind locked doors following the resurrection of Jesus. Again He is there for them when they need Him most. His words on this occasion are also reassuring "My peace I give to you" We cannot see Jesus but He can certainly see us. Isn't that reassuring? Of course our faith is small maybe as a mustard seed but big enough to remember other words from Scripture " Wonderful words of instruction and certainty, "Cast your cares upon the Lord because He cares for you" (1 Peter 5:17) He can move mountains. He will never leave us alone in any situation however dreadful it may be. Remember also He is never further than a prayer away. So it shouldn't be surprising to learn that the devil will do everything to stop us praying for reinforcements from heaven. His plan is to remove our peace and stop the power of God coming into play. I believe it is so true what the hymn writer wrote "The devil trembles when he sees, the weakest saint upon his knees"
Finally remember that when we pray we can only be heard and have prayers answered in the name of Jesus. It is because we are joined to Jesus that our prayers are heard and answered. What an incentive to pray! Jesus knew the power of prayer and spent whole nights in prayer seeking strength and wisdom for the day ahead of Him with all its challenges. He met and won victory after victory through prayer. We are encouraged to do likewise in His name. G'day! 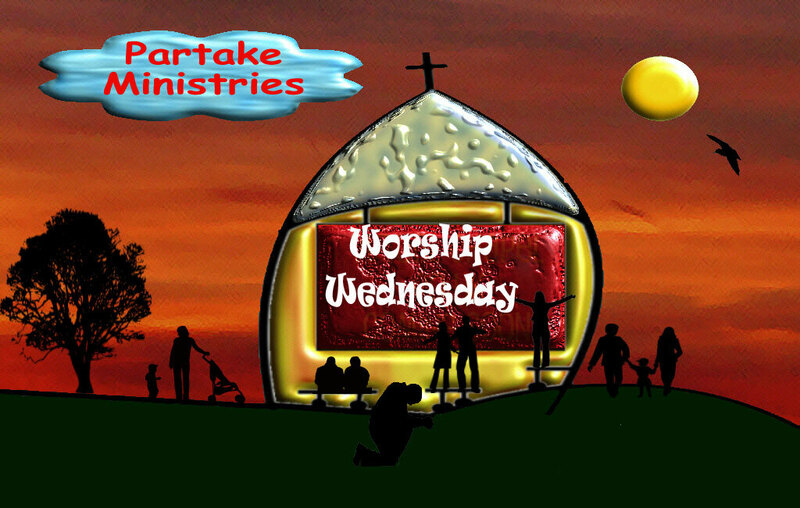 Welcome to Partakers Wednesday Worship on the 26th of October 2011. Father God, we come with confidence through faith. Father God, we stand before your throne of grace. We can only come, stand before your throne, because Christ has made the way; shed his precious blood as our sacrifice, so we offer you our praise. Hallelujah, hallelujah, hallelujah! The way is open to the Father, hallelujah! as we offer you our praise. Father God, we come, hallelujah. Hebrews 4:14-16 Therefore, since we have a great high priest who has ascended into heaven, Jesus the Son of God, let us hold firmly to the faith we profess. For we do not have a high priest who is unable to empathize with our weaknesses, but we have one who has been tempted in every way, just as we are-yet he did not sin. Let us then approach God's throne of grace with confidence, so that we may receive mercy and find grace to help us in our time of need. Hebrews 6:19-20 We have this hope as an anchor for the soul, firm and secure. It enters the inner sanctuary behind the curtain, where our forerunner, Jesus, has entered on our behalf. He has become a high priest forever, in the order of Melchizedek. G'day! Welcome to Partakers Wednesday Worship on the 2nd of November 2011. Lord, I must be yours alone. Teach me I am not my own. Crush and mould this heart of stone. In your image make it. Let me learn to follow you. Take my will and break it. From my self I would be free. Seize my pride and shake it. My life, on Him, I stake it. We start with this brief prayer! O Merciful Father, We thank you that you are a loving God! We thank you for the gift of your Son Jesus Christ! We thank you for the gift of the Holy Spirit! We thank you for life and that we can know you personally! Amen! Time to confess our sins! Now we are free to give our God praise, knowing that we have confessed our sins, He has forgiven us and there is no impediment to our praise! Time of praise with Psalm 134! Come, bless God, all you servants of God! You priests of God, posted to the nightwatch in God's shrine, Lift your praising hands to the Holy Place, and bless God. In turn, may God of Zion bless you- God who made heaven and earth! I wonder how you view Jesus Christ! What is your opinion of the man whose very birth splits history into two parts - before his birth and after his birth! This Jesus, the Word of God! In the beginning, this Jesus the Word, already existed. This Jesus the Word was with God, and this Jesus the Word was God! Jesus the Word existed in the beginning with God. God created everything through Jesus the Word, and nothing was created except through Jesus the Word! Jesus the Word gave life to everything that was created, and his very life brought light to everyone. This light, Jesus the Word, shines in the darkness, and the darkness can never extinguish the light. That's Jesus Christ! The man who was and is God! Jesus Christ who is the visible image of the invisible God. Jesus Christ who existed before anything was created and is supreme over all creation! Indeed, for through Jesus Christ, God created everything in the heavenly realms and on earth. Jesus Christ made the things we can see and the things we can't see - such as thrones, kingdoms, rulers, and authorities in the unseen world. Everything was created through Jesus Christ and for Jesus Christ. Jesus Christ existed before anything else, and he holds all creation together. Jesus Christ is also the head of the church, which is his body. Jesus Christ is the beginning, supreme over all who rise from the dead. Therefore, Jesus Christ is first in everything. For God in all his fullness was pleased to live in Jesus Christ, and through Jesus Christ alone, God reconciled everything to himself. Jesus Christ made peace with everything in heaven and on earth by means of His very own blood on the cross. That's my Jesus! My Jesus who is fully divine, fully human, glorious in His death and resurrection! My Jesus who is supreme over all, the creator of all! My Jesus who is my eternal leader, eternal sustainer! My Jesus who has all power and all authority! My Jesus who reconciles me with God, my peace-maker with God and is the one who gives perfect peace! There is only one Saviour for the world. There will never be another because there is no need of another. This Jesus is coming back as well!!!! But Jesus is not coming back as baby next time but as the living holy Almighty Son of God! What does Jesus look like now? His close friend John saw him some years after Jesus' ascension back to the right hand of God! Here is what John saw! Jesus, dressed in a robe reaching down to his feet and with a golden sash around his chest. The hair on Jesus' head was white like wool, as white as snow, and his eyes were like blazing fire. Jesus' feet were like bronze glowing in a furnace! Jesus' voice was like the sound of rushing waters. Jesus' right hand held seven stars! Coming forth out of Jesus' mouth was a sharp, double-edged sword. Jesus' face was like the sun shining in all its brilliance. That was an amazing moment when Jesus beloved friend, John, saw Jesus in all his majesty! This John, who records these words from Jesus! "It is finished! It is complete! I, King Jesus, am the Alpha and the Omega-the Beginning and the End. To all who are thirsty I, King Jesus, will give freely from the springs of the water of life. All who are victorious will inherit all these blessings, and I, King Jesus, will be their God, and they will be my children. "But cowards, unbelievers, the corrupt, murderers, the immoral, those who practice witchcraft, idol worshipers, and all liars-their fate is in the fiery lake of burning sulphur. This is the second death." "Look! I, King Jesus, am coming soon, bringing my reward with me to repay all people according to their deeds. I, King Jesus, am the Alpha and the Omega, the First and the Last, the Beginning and the End." That's my Jesus, who called me to follow Him almost 30 years ago now! It has been a rollercoaster ride, but I have always known that He is in charge! Are you one of His followers or are you continuing to be one of His deniers? Now let us finish up with a song! Today it is Marjorie Reece singing a "Praise Song to Jesus"
Jesus! Jesus! You are the King of Kings! Blessed Jesus, Sweet Jesus, You are my everything. And, Lord, I love you. I love You. And I'll love you more and more. O Lord, I love you, I love You. You loved me long before. Lord, I worship You. I worship You. You are the Ransomed Lamb. O Lord, I worship You. I worship You. You are the Great I Am. O Lord, I praise You. I praise You. Praise You for all You've done. O Lord, I praise You. I praise You. You are God's Only Son. Yes, You're Jesus, blessed Jesus. You are the King of Kings. Blessed Jesus, sweet Jesus. You are my Everything. And, Lord, I love You. I love You. And I'll love You more and more. Oh, yes, I love You. I love You. 'Cause You loved me long before. You loved me long before.